Resurrection reviewed: ABC’s new drama doesn’t compare to its French cousin The Returned. When it comes to coming back, the French do it better. 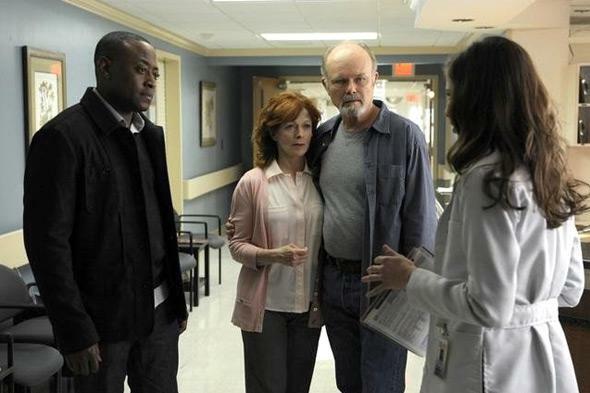 A still from Resurrection, ABC’s new drama about dead people who come back to life. Once upon a time, I had a toaster. A standard model, two-slots-for-two-slices-of-bread toaster. It toasted bread pretty well. Sometimes I had to jam in bagels. Sometimes those bagels singed, because, being jammed in, they could not be effortlessly ejected by the toaster’s spring. Sometimes I had to toast things twice to get the proper toastiness. But basically, it did what toasters are supposed to do—toast toast—and I was content with it. And then one day, I used a toaster oven. Compared to a regular toaster, a toaster oven looks cavernous and complicated. It has knobs. It has a tray. You can fit an entire loaf of bread inside. But it can do things a toaster could never do: reheat leftovers; melt cheese on top of sandwiches; toast objects thicker than a slice of bread. A toaster oven makes a standard toaster seem limited, pathetic, small. I could not go back to using one. Resurrection, ABC’s new drama about dead people who come back to life, is the standard toaster to the fantastic French series The Returned’s toaster oven. I found Resurrection to be perfectly serviceable—until I started using The Returned’s better model. Though Resurrection and The Returned share a premise, they are, somehow, based on different source materials. The former on a recently released novel, confoundingly called The Returned, and the latter on a French film titled They Came Back, but in French, also called The Returned. In both series, people who died violent deaths return to life, not as zombies, but as themselves, and are reunited with their aged loved ones, who have spent years grieving their loss. Resurrection’s pilot concerns itself with Jacob, an 8-year-old boy who wakes up in a rice paddy in China, and soon directs immigration and customs agent Marty Bellamy (Omar Epps) to Arcadia, Mo. It turns out that Jacob drowned 32 years before, but appears not to have aged a day, and is greeted by his now much older parents with a mixture of joy, disbelief, trepidation, and lots of emotional face-caressing. As the nicely creepy advertisements that aired endlessly during the Academy Awards made clear, Jacob is not the only one coming back. But since I watched the pilot of Resurrection, I watched all of The Returned (which is now streaming on Netflix). Unfortunately for Resurrection, The Returned is vastly superior in every way. While the two shows both contain bereft parents, law enforcement officials with personal agendas, pastors with painful backstories, quiet and sometimes spooky small boys, and newly reanimated criminals, the atmosphere in which Resurrection places them is thinner than Mt. Everest’s. Compared to The Returned, Resurrection’s performances, eeriness, themes, its production values, storylines, and opening credit sequence are all similarly weak. Resurrection is saddled by a cop story—Bellamy is going to get to the bottom of what’s going on!—and a cliffhanger imperative: When Jacob mentions a mysterious man who was present when he died, the show immediately cuts to a shady stranger, so you think the boy might be in danger. It doesn’t trust that its enormous central mystery—how and why did these people come back to life?—is enough, so it tacks small-bore mysteries on to the deaths of each revived character. On The Returned, when a teenager girl first arrives back home, her mother reacts not so much with shock or happiness but with a surprising fear: Now that her daughter was back she could be taken away again. This is the kind of surprising nuance Resurrection never even approaches. I realize that I am telling you this perfectly passable network show is no good because a far better foreign version exists. Please do not mistake this for snootiness: It’s just standards. Ideally, shows should be judged on their own terms—but The Returned is Resurrection’s own terms. It is everything that Resurrection could be, and is not quite. Go with the toaster oven.